This beautiful, tall wildflower has very distinct spikes of pink to purple flowers. Although it is often considered weedy, this tall perennial can look striking in wilder areas of the garden. 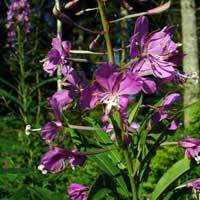 Fireweed spreads readily underground, so it can be difficult to contain. Plantwhere you don't mind it spreading. Spreads readily from cottony seeds.